Situated at the crossroads between Chinatown and Tanjong Pagar, Six Senses Maxwell is a 138-room property housed within a block of conserved shophouses along Cook Street. Its design reflects its heritage, peppered with accents that draw cues to its local context, such as the historical documents framed up on the walls, next to yesteryear photographs of Singapore. Most of the hotel (including the rooms and common areas) is clad in ethically-sourced wenge hardwood flooring while the corridors leading to its restaurants and bars feature stone tiles originally from Italian medieval churches and cathedrals. Sister property Six Senses Duxton, which opened last April, is a short walk away; together with Six Senses Maxwell, the two hotel buildings are collectively known as Six Senses Singapore. Guests are able to use facilities situated within the two separate buildings, which include access to the rooftop pool and soon-to-open spa pods in Six Senses Maxwell. As I entered the lobby of Six Senses Maxwell, I’m instantly charmed by the well-crafted details that I see from the get-go. A cabinet of curiosities by the entrance displays a locally-inspired selection of porcelain and other sustainably-sourced beautiful objects, while the main reception area is furnished in a handsome mix of upholstered wall panels, dark wood cabinetry, hand-made rugs and high-backed velvet seats. Under the charge of French designer Jacques Garcia, the hotel’s sumptuous interior is a tactile feast for the senses; the lobby alone, is an enchanting tableau that offers a hint at more stunning spaces to discover. The journey to room is as memorable. I traverse a long, winding hallway on the second floor that seems almost endless, and is sumptuously furnished in dark wood and damask carpeting. Another intriguing detail is the teal plasterwork on the doors and walls, which draw reference to its colonial-style architecture. My room is conveniently located next to the gym and the lap pool; adjacent to the latter is the Max’s Rooftop Bar, which is slated to open soon this year. I stay in the Cook Street Deluxe room, which basks in the natural daylight. 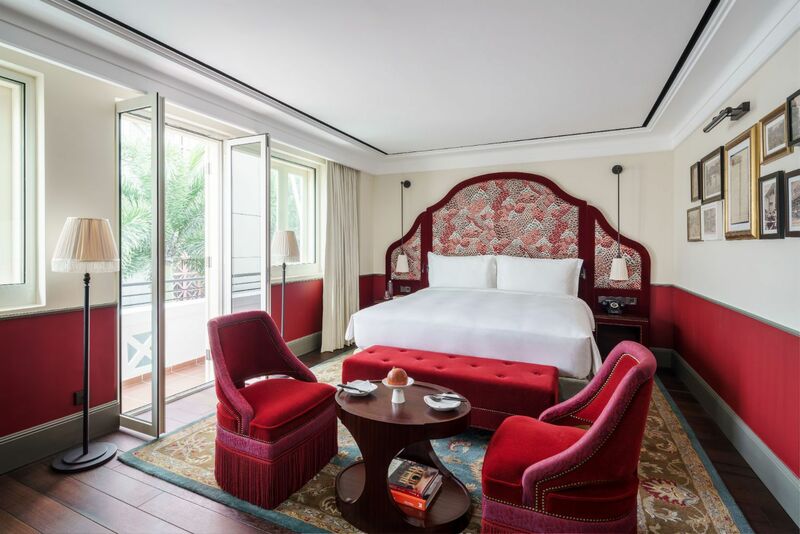 My favourite detail is the custom-made headboard, which features an embroidered pattern inspired by peacock feathers, with bedside tables conveniently integrated into its structure. Velvet armchairs in teal complement the emerald tones, the hand-woven rug and the set of mahogany furniture in the room. Other bespoke details include the floor lamps, pendant lights and wall sconces found in the room and throughout the hotel, designed by Garcia and produced by lighting brand Zonca. While the bathroom is compact, every corner of it is well-decorated. The walk-in shower is lavishly clad in natural stone, while the vanity features vintage-style fixtures from Lefroy Brooks 1900 and a marble countertop. A set of photographs depicting the neighbourhood also add a local character to this petite space. True to the Six Senses' focus on sustainability and wellness, each room is furnished with reusable glass bottles for drinking water, toiletries by The Organic Pharmacy, along with an array of accessories including The Oh Ball, a massager ball meant to ease foot pain. Each guest can participate in the complimentary yoga group session in the morning and attend a personal consultation at Six Senses Duxton to receive health advice from a physician trained in Traditional Chinese Medicine (TCM). On top of that, a “wellness bag” is presented to guests daily: it includes a brain teaser, colouring pencils, tote bag as well as locally available ointments such as nutmeg oil and tiger balm. Don’t miss out on the cocktails at Cook & Tras Social Library, a space we’ll expect to be frequently photographed. With its mirrored ceiling and a bar counter that spans a 20m length, the restaurant-bar is a show-stopping space with a small-plates sharing menu and bespoke cocktails inspired by Southeast Asian flavours. True to its name, the restaurant-bar is furnished with a handsome collection of over 3,000 books centred around the themes which include wellness, natural history, herbal medicine and sustainability. Other enchanting spots include the Rose Bar & Lounge, where red velvet seats are paired with burnished mirrors and hand-painted floral panels. Next door, the Murray Terrace Brasserie is as notable. The hotel’s main restaurant focuses on Mediterranean culinary methods featuring sustainably-sourced seasonal ingredients and organically-grown produce from the edible garden at the hotel’s rooftop. Oenophiles will love its wine tasting table, which sits in front of six full-length wine chillers that contain over 1,500 bottles of primarily Old World wines. Opt for the Terrace room type, to get a room that comes with your personal balcony area; selected rooms feature a free-standing clawfoot bathtub and a spacious vanity area. The special opening offer available from now to March 31, 2019, also includes a free room upgrade as well as complimentary breakfast and two signature cocktails.